An awareness initiative focused on showing the realities of life with all types of diabetes through visuals. Welcome to the new home of #MakeDiabetesVisible, an awareness initiative focused on showing the realities of life with all types of diabetes through visuals. 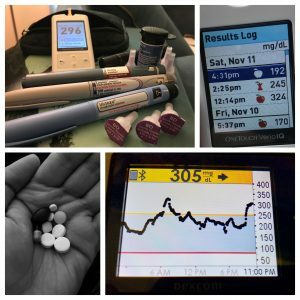 #MakeDiabetesVisible began in November 2017 after I was inspired to create a photo challenge for Diabetes Awareness Month. The inspiration came from the various 7 day photo challenges that are popular on social media these days. The difference being that this challenge would run the full month of November and it would focus on living with diabetes. And so, the hashtag #MakeDiabetesVisible was born. The response was greater than I could have imagined, with hundreds of people with diabetes sharing their stories through images across Facebook, Twitter, Instagram, Blogs, etc… And folks have continued to use the hashtag in the year that has passed since it was created. Since the initiative was so well received, I felt it was time to give it a more permanent home on the web. A central location where information about the photo challenge can be found, and where the stories of fellow people with diabetes can be featured. Here you’ll find dedicated pages for Facebook, Instagram, and Twitter that will highlight contributions to #MakeDiabetesVisible from those platforms. This is very much an evolving project, so bear with me as the pieces come together.